Information in this executive summary was updated as at March 2017. There are many links between health and housing. This JSNA chapter will demonstrate that people who have a good home are more likely to be healthy than those who do not. It is also clear that the demand for health services is directly affected by those in poor housing conditions. The British Research Establishment (1) estimated the impact of poor housing on the cost of health services to be £1.4 billion per annum; similar to the health costs of smoking. The Surrey Homeless Health Needs Audit Report undertaken in 2016 (2) has shown that homeless people in Surrey are frequent users of GP, hospital and ambulance services. National studies (3) have also shown that more than half of those living in temporary housing accommodation experience a decline in their health leading to a greater demand for health services. In contrast, those who are well housed, with appropriate levels of support, use health services far less. Vulnerable people who receive Housing Related Support (HRS) are 30% less likely to use GP services and 30% less likely to go to hospital (4). Therefore if health, housing, planning and social welfare agencies work together to reduce housing risks, and improve housing, then there are likely to be very tangible benefits for health and housing services, as well as for the individual. Homelessness – In Surrey, the number of households in temporary accommodation increased to 862 in December 2016 and has risen by 144% since June 2011 (5). 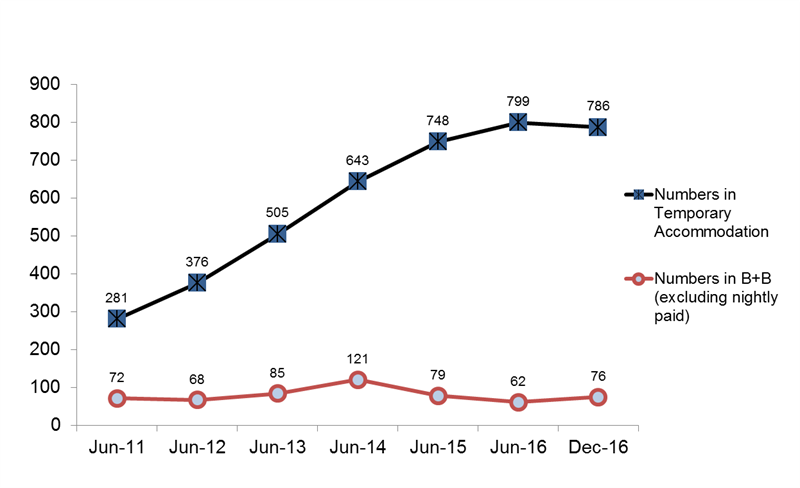 Rough sleeping is also on the rise and estimates of those sleeping rough have almost quadrupled in the last 5 years (6). These rises are similar to those being experienced elsewhere in the UK. Overcrowding – 2011 census records show that overcrowding is not as high in Surrey (7% of households) as it is elsewhere in the UK (8.7% of households). Levels of overcrowding are slowly rising and it is more prevalent than it was in 2001. Poor housing – Information on the condition of the housing stock for Surrey is incomplete so it is difficult to determine the extent to which poor housing contributes to bad health in the County. National research (7) indicates that poor housing is more common in the private rented sector, where it is estimated that 29% of homes fail decent homes standards. 2011 census data shows that 13.5% of the homes (63,875 properties) within Surrey are privately rented; there is therefore a risk that a proportion of these provide poor housing. A good supply of decent housing helps to reduce homelessness and improve health. The price of housing to rent or buy in Surrey is high and finding a decent home at a cost that is affordable is difficult for many people. The number of affordable homes in Surrey is also lower than elsewhere in the UK and in April 2016, there were just over 15,000 households registered with Surrey local authorities for affordable housing (5). The government is introducing new duties for borough and district councils through the Homelessness Reduction Bill, which is expected to come into force in 2018. The Bill amends the definition of homeless and extends the range of people that a local councils must help and will increase demand for affordable homes and housing related support for a wide range of client groups. Each Surrey borough and district council influences the supply of housing through its Local Plan. The Local Plan consists of a number of policies and proposals, which aim to guide future development in the area. It sets out the land available for community infrastructure, employment and new housing and determines the proportion of new affordable homes that are required. Planning policy requirements have delivered many affordable homes in Surrey in the past and will continue to do so in future. The government are keen to accelerate housing supply through the planning system and the Housing and Planning Act 2016. It recognises the need to provide affordable housing however, it wants to ensure that the majority of new affordable homes are either starter homes for sale or shared ownership. In Surrey, such homes are unlikely to be affordable to many people in housing need. In February 2017, the government published a white paper – Fixing our Broken Housing Market DCLG (8). This paper calls for local authorities to produce an up-to-date Local Plan to meet housing demand in their area. It also proposes further measures to speed up the provision of housing and a wider definition of affordable housing. The extent to which these proposals will help address housing need and demand in Surrey is uncertain but it is clear that Local Plans will remain an important part of housing delivery. Although housing is the main focus of this chapter many people in need require more than just a home to live independently; they also need support. Housing Related Support (HRS) services are provided to many vulnerable people in Surrey and government based research (4) confirms that these services are important and help to reduce the number of costly health interventions. There are changes proposed, at both a national and local level, to the funding of HRS services. These changes are necessary because of budget constraints, but they will need to be implemented with care if services are to remain viable and the current benefits they deliver retained. This chapter of the JSNA draws together a wide range of health and housing issues and makes a number of recommendations for future commissioning. The aim is to put in place working arrangements for health, housing, and social care that will tackle housing problems and thereby improve health. The detailed recommendations are set out at the end of the chapter. The overriding emphasis must be for public agencies within Surrey to work together to provide effective solutions to housing issues. The impact of homelessness on health can be severe and wide ranging. Rough sleepers can suffer from mental health problems, severe depression, psychotic disorders, addictions or personality disorders, and families in temporary accommodation have a higher risk of illness than the general population. Local housing authorities have a legal duty to secure accommodation for people who are homeless or threatened with homelessness. However, certain criteria need to be satisfied before an individual can receive this assistance and in particular, they must be in ‘priority need’. Broadly speaking the term priority need covers vulnerable people and families with dependent children and excludes single people who are not vulnerable. There are many cases of homelessness in Surrey each year and 978 cases were determined by borough and district councils in Surrey in 2015-16. Not all of those who applied for assistance meet the criteria and a total of 612 households were accepted by local authorities in Surrey in 2015/16. Homelessness levels have been high in Surrey for a number of years leading to an increased use of temporary accommodation. In December 2016 there were 862 Surrey households in temporary accommodation. Between June 2011 and December 2016, the number of households in temporary accommodation/bed and breakfast had increased by 144% (5). In line with national trends, rough sleeping in Surrey has also increased over the last six years. 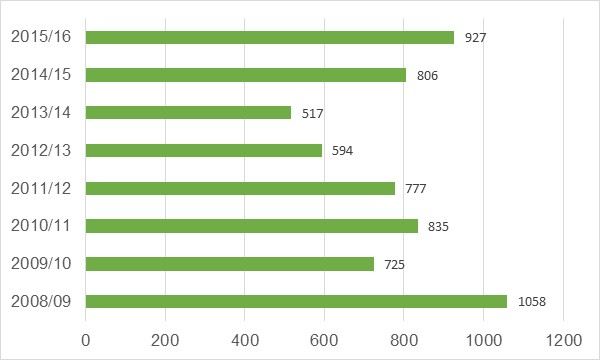 Source – DCLG Street count and estimates of rough sleeping on a single night. Overcrowding can impact on health and can make it more difficult for children to study, affecting attainment at school. Children in overcrowded homes also have a greater risk of respiratory problems, meningitis and slow growth. Levels of overcrowding in the County are gradually increasing. This trend is likely to continue as the Benefit Cap, which restricts how much is paid to families for housing and other costs will make it more difficult to rent larger homes. 2011 census data indicated that in Surrey 7% of households were overcrowded compared with 8.7% nationally. Overcrowding is more prevalent in rented housing, with 9% of social tenants and 7% of private-renters living in overcrowded homes, compared to 1.6% of owner-occupiers. 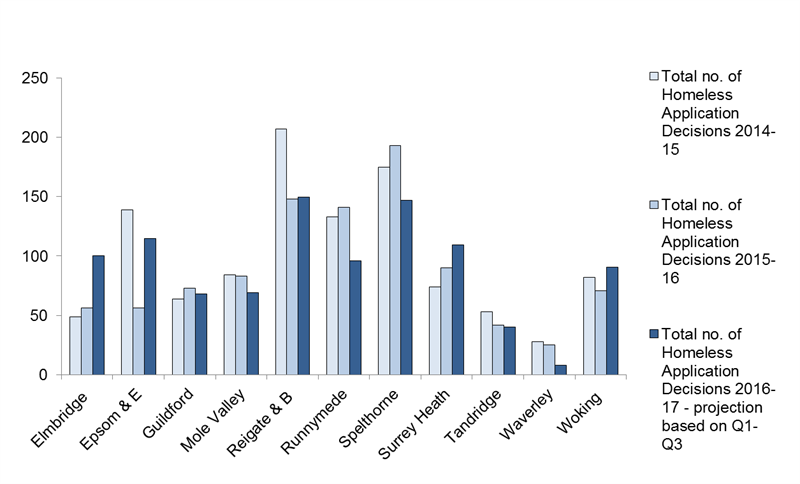 Overcrowding is the highest in Spelthorne (9%) and Woking (8.9%). Building Research Establishment (BRE) research (1) has shown that poor housing costs the NHS more than £1.4 billion a year and the cost was similar to that caused by smoking and alcohol. The cost increases to £2 billion when all significant health and safety hazards in the home are included. Details of house conditions in Surrey are incomplete but it is known that 2% of homes lack central heating. Poor insulation/energy efficiency within homes and rising fuel costs make it difficult for many to adequately heat their homes. A cold home increases the risk of cardiovascular, respiratory and rheumatoid diseases, and also contributes to winter deaths. Many people require more than just a home to live independently; they also need different levels of support. Housing Related Support services (HRS) help many vulnerable people in Surrey to live independently and they also reduce the demand for other services. Government sponsored research (4) has shown that people in receipt of HRS services are less likely to use health services (25% less likely to use A & E services, 35% less likely to use acute mental health services and 30% less likely to use GP services). HRS services also help to prevent homelessness. Homeownership is the dominant tenure in the County and property prices are very high. In 2016/17, average house prices were 13.8 times that of average salaries (9). Looking at the sale price of the lowest quartile of homes on the market, house prices are 10 times the household income, of those with the 25% lowest income band. This means that home ownership is out of reach to many households. Census data indicates that the Private Rented Sector is growing and in 2011 was 13.47% of the market in Surrey. Rents in this sector are much higher than in other parts of England and although many people on low incomes now live in the privately rented homes, they are often dependent on benefits and vulnerable to changes in the welfare system. Affordable housing is in great demand in Surrey. However, census data has shown that the County has a lower proportion of affordable social rented homes (11%) than the rest of England (18%). There are a number of central and local government proposals which will impact on housing services over the next five years. Both these measures will influence the type of affordable housing that is available. Starter Homes may help some first time buyers to get on to the property ladder, but they will not help those on low incomes. The extension of the Right to Buy to Housing Association/Registered Provider tenants is likely to reduce the social rented stock in the County. The government has said that those homes sold will be replaced, but it is not clear how this will be achieved in areas like Surrey, where land prices are very high and opportunities to replace homes are limited. The proposal to place a higher value sales levy on stock holding councils presents a risk that vacant council homes may need to be sold to fund the levy. This could lead to a reduction in the asset base and increase the pressure on the future financial viability of existing social housing stock. The Act also introduces improved enforcement measures for the private rented sector. Whilst this will help to improve standards, it may also lead to higher rents that could make the sector less accessible to those on low incomes. Additional regulation may also discourage landlords from remaining, or entering, the sector. Housing White Paper: In February 2017, the government published a housing white paper Fixing our Broken Housing Market (8). This paper is largely about housing delivery and seeks to speed up the planning framework, e.g. by shortening the life of planning consents and enable homes to be built more quickly. The White Paper proposes a new much wider definition of affordable housing that will include Starter Homes and other low cost home ownership initiatives; it will also include some private rented accommodation as well as social rented housing let at affordable rents. Starter Homes will also be limited to households with combined incomes of less than £80,000 or £90,000 in London. As part of the proposals borough and district councils will need to produce an up to date Local Plan for housing demand and there is an added expectation that developers will avoid “low density” housing where land availability is short. A three-year, mandatory, 1% year on year, rent cut on all social rented housing, which includes supported housing. Supported housing rents and service charges are to be linked to the Local Housing Allowance (LHA) rate for private sector tenants prevailing in each area from April 2019. Stricter rules will apply for eligible housing costs as part of the new Universal Credit (UC) system; some costs currently met by Housing Benefit will not qualify under UC. Changes to the benefit entitlement towards housing costs for unemployed single people aged 18-21 in receipt of UC from April 2017. There are only limited exemptions for certain young people, such as care leavers, those in temporary accommodation, young people who have been working for the previous six months, or where it is inappropriate for them to live with their parents due to risk of domestic violence. The government recognises that the cost of providing some supported housing will be greater than LHA rates, so have recently consulted about a mechanism to cover relevant costs over and above these amounts to provide stability for the sector in the long term. A Green Paper is to be published in during 2017 setting out proposals to be introduced before April 2019. Following an unprecedented demand for social care services across the County, Surrey County Council has commenced a review in which it will refresh its approach to accommodation with care and support for vulnerable adults. It is anticipated that this review will involve decommissioning of all Adult Social Care HRS services, with a view to re-commissioning some services during 2017. From 2017, HRS services for young people are also to be restricted by the County to those aged 16-21, rather than 25, other than services for young parents and care leavers. An accommodation needs assessment is also being carried out with a view to re tendering for HRS services for Young People from April 2018. The impact of the regulations in relation to the restriction of benefit entitlement towards housing costs for those aged 18-21 is yet to be determined, but is likely to affect some of those that would access supported housing. Other HRS services for those with substance misuse issues and those subject to domestic abuse are also expected to be retendered over 2017/18. All of these changes will need to be implemented carefully as they have the potential to affect the viability of local supported housing services and impact on the level of assistance given to vulnerable and homeless people. The Bill will promote the need to develop ‘pathway plans’ for these groups where the problem is ‘more than the need for a roof’. These new measures are expected to increase demand for temporary accommodation and for existing HRS services. They come at a time when these are already in short supply. The above information demonstrates that health and housing are inextricably linked. A range of measures are needed to tackle these problems and it will be necessary for organisations to work together to resolve them. The impact on health of homelessness is the most profound amongst rough sleepers. A report issued by CRISIS and Sheffield University (11) has shown that rough sleepers have a significantly lower life expectancy, with an average age at death of just 47 years for men and 43 years for women. The report also concludes that they are 9 times more likely to commit suicide. The 2016 Surrey Homeless Health Needs Audit Report (2) has shown that single homeless people are frequent users of emergency health services. Out of 309 people interviewed 145 of them (47%) had been to A&E in the past 12 months and 60 of these (19%) had used the service three times or more in that same period. Of those that attended A&E/ hospital or made use of an ambulance service in the past year, the leading reason given was physical health problem or condition (22%), followed by self-harm/attempted suicide (15.6%). In 2013 he was given a chance to complete an alcohol detox at Windmill House and to move to supported accommodation in one of Transform’s recovery houses. He now has a stable, safe and supportive home from which he has started to rebuild his life. It has also significantly improved his health. Although rough sleeping has the most dramatic impact on health, living in temporary accommodation also affects wellbeing. In December 2016, there were 862 Surrey households in temporary accommodation and there were also many single people living in hostels. This type of accommodation is necessary to ensure families have somewhere to live, however, there is evidence that long term use of temporary accommodation has a significant impact on health. National surveys (3) have shown that 58% of families placed in temporary accommodation suffered deterioration in heath and that this situation increased the longer that they were in such accommodation. As indicated above, the number of families in temporary accommodation in Surrey has risen significantly since 2011 and many children are in accommodation where there is insufficient space for them to play or study. Research has shown that children are vulnerable in overcrowded homes where they become at risk of Meningitis: (12) (13). A study of 6,574 children undertaken as part of the National Child Development Study (14) found that slow growth was most common in overcrowded housing. Statutory guidance states that children should not be placed in bed and breakfast accommodation with shared facilities for more than six weeks. However, there is a shortage of temporary accommodation in the County and it is therefore difficult to move families from bed and breakfast accommodation within the timescales. In June 2016, there were 17 Surrey families occupying bed and breakfast accommodation with some shared facilities for more than six weeks; the average over the previous four quarters was 12 households (15). Young people (16-25) can become homeless as a result of a range of situations. They may be abandoned children, young people fleeing domestic abuse, care leavers, young parents, asylum seekers or young people from homes where family relationships have broken down. Suitable temporary accommodation for young people in Surrey is limited and in the past it has been necessary to use bed and breakfast accommodation. This type of accommodation is not appropriate for young people as it can lead to isolation, safety risks, difficulties controlling behaviour and problems providing support. There is concern that the loss of benefit entitlement towards housing costs for young people aged 18-21 with limited exemptions is likely to increase homelessness and potentially rough sleeping among this age group as UC rolls out across the County. The 2011 Census data shows that 12.6% of people aged 65 or above in Surrey live alone, increasing the risk of isolation and depression. Older people are less likely to be homeless: only 3% of homeless people nationally were aged over 65 in 2014 (16). They are also less likely to be living in overcrowded homes, but many may be living in homes that are large and difficult to maintain. This can mean that they are at risk of severe cold and trips and falls. A significant number of people in Surrey have mental health issues. This number is projected to rise in future years. Many factors influence an individual’s mental health and the connection between homelessness and mental health issues is complicated. For example mental health issues have been found to be both a cause of long term rough sleeping, as well as a symptom of the experience of becoming and remaining homeless. An individuals’ wellbeing can also be negatively affected by the experience of being homeless. Mental health issues have a long association with stigma and discrimination and homeless people with mental health problems also run the risk of being excluded and falling between services. The Guildford and Waverly CCG Health Profile (17) found that people with mental health conditions are four times more likely to die prematurely from respiratory disease and twice as likely to die from cardiovascular disease. Excess premature mortality also appears to be higher in Surrey than the England average (17) it is therefore important to ensure access to primary and secondary health care for homeless people. In Surrey 21,233 adults (2.37% of the population) are estimated to have a learning disability. Of these 16,914 people are aged 18-64 and 3,891 are aged 65 and over. The number of people with a learning disability is estimated to increase nationally by 1% per annum over the next 15 years (18) due to increased life expectancy and the increasing numbers of children with complex needs surviving into adulthood. Many people with learning disabilities live with parents and issues of homelessness can arise when a remaining parent dies. A wider range of accommodation options is needed to allow for independent living and to deal with these sudden changes. There is no data to confirm the extent of learning disabilities amongst existing homeless people within Surrey. However, national research (15) in 2009, found that 12% of homeless people could be considered to have an intellectual disability. This compares with 2% in the general population. Homelessness can often follow domestic violence within the home and the most common health risks associated with domestic abuse are physical injury, depression, self-harm, suicide and homicide. There may also be health risks for children and others within the family, who witness violent incidents. Establishing a clear picture of the extent of domestic abuse in Surrey is difficult as it is often a hidden crime and under-reported. However, it was estimated that 23,922 women and girls aged 16-59 in Surrey would be victims of domestic abuse in 2014/15 (19). There are no similar statistics about men, children, young people and families in Surrey. Domestic abuse can often lead to homelessness and Housing Officers within Surrey have reported an increase in the number of homeless approaches from victims. 7% of homeless applications were from households fleeing domestic abuse in the year prior to 30th September 2016. 2011 Census results show that there were 2,261 gypsies and travellers living in the County i.e. 0.2% of the population. Needs mapping exercises have shown that there are often issues of overcrowding amongst travellers and there is a shortage of pitches within the County. People who have an addiction to drugs or alcohol can frequently find it hard to find and retain accommodation. As indicated above substance misuse and alcohol dependence, is also a frequent problem amongst rough sleepers and there can be difficulties providing services for this mobile group. In recent years, there have also been problems with the use of Psychoactive Substances (NPS or legal highs) amongst rough sleepers, and use of these drugs increases anti-social behaviour and aggression. New legislation banning them has helped to address this, in part, but they still remain available on line. The 2011 census indicated that 90.4% of the population reported their ethnic group as ‘white’. Information gathered by local authorities for the first 3 quarters of 2016/2017 (5) indicates that 84% of homeless households who responded to queries about ethnicity when they were homeless described themselves as ‘white’ (5). Proportionately this would suggest that more non-white households are becoming homeless than white households. However it should be noted that almost 13% of households did not respond to queries about ethnicity. The level of need for affordable housing in Surrey is difficult to quantify. Each of the boroughs and district maintains a waiting list (the Housing Register). This gives an indication of the minimum extent of need but it does not provide the total picture, as some households do not register. The eligibility criteria also vary between areas. 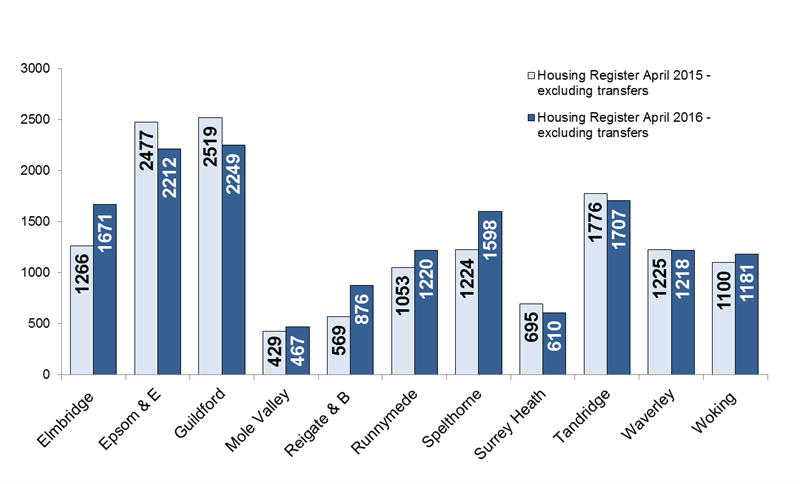 In April 2016, there were 15,009 individual households registered on housing lists in Surrey and the numbers have increased by 4.7% in a year (5). It is clear that a significant core of households cannot find affordable accommodation. Demand for accommodation for single homeless people is high and service providers report that it is increasingly difficult to cater for those with more complex needs who present a high risk to both themselves and/or others. There are a small number of HRS services for single homeless people with support needs. There are also shared hostels and two night shelters where the length of stay is very short. However the current services do not address the level of need. The Homelessness Reduction Bill is likely to increase demand for accommodation and support for single homeless people with a range of support needs. the Surrey Homeless Alliance South West service (SHAWS) providing outreach services in Woking and Waverley (now rebranded the York Road Project (YRP) Outreach Service) working with Guildford’s existing Homeless Outreach and Support Team (HOST). Guildford, Waverley and Woking have also made a successful bid for funding under the DCLG Rough Sleeping grant programme. This will provide £369,220 over the period between March 2017 and March 2019 to provide additional support to the Rough Sleeping outreach services across Guildford, Waverley and Woking. Two specialist mental health support workers and two wellbeing workers will be provided, to help address the health needs of rough sleepers, single homeless people and those at risk of rough sleeping. Two of the workers will be based in Guildford with the Homeless Outreach and Support Team (HOST) which is run by Riverside housing Association. The other two workers will be based with the York Road Project in Woking (the night shelter) which provides an outreach services for rough sleepers in Woking and Waverley. Although they will be based with the outreach services, they will operate across all three boroughs and offer support people living in homeless hostels or independent tenancies that are at risk of homelessness due to their mental health issues. Appropriate housing options for young people between 16 and 25 remains a priority across the County, including accommodation for unaccompanied asylum seekers. Joint working between SCC Youth Support Service (YSS), the borough and district councils continues and the YSS lead role in in dealing with homeless 16 and 17 year olds is effective. Previous concerns, such as the use of bed and breakfast for young people have been addressed and there are pathways in place for young people needing housing and other support. This includes emergency and assessment beds, supported lodgings and a range of hostel, shared housing and some self-contained units across the county. Since these services were commissioned, the YSS has introduced some variations to the contract, notably an upper age limit of 25 for anyone placed in any YSS funded support beds. This will to reduce to 21 from April 2017, other than for services for care leavers and young parents. There is concern that this will cause difficulties for those aged 21 to 24, as and anyone that is not working receives a lower Job Seekers Allowance or Universal Credit rate than those aged 25 or over. In addition those under 35 face restrictions in claiming housing benefit, to the shared housing rate, so they will not have funds to meet both their likely housing and living costs. The YSS is currently reassessing housing needs of young people with a view to recommissioning services from April 2018. It is not known if existing services will continue to be funded as savings will be required through the recommissioning process and care will need to be taken to ensure the recent improvements are not lost. The impact of changes to benefit entitlement towards housing costs for those aged 18 to 21 in receipt of Universal Credit will also need to be considered. Surrey County Council has published its Accommodation with Care and Support Strategy (21), in which increasing the provision of affordable Extra Care housing within the county is a key strategic aim. Adult Social Care along with colleagues in the Clinical Commissioning Groups (CCGs) and boroughs and districts recognise the value of Extra Care housing in reducing pressures on more acute services, enabling better models of preventative working and facilitating independent living for older within their homes for longer. 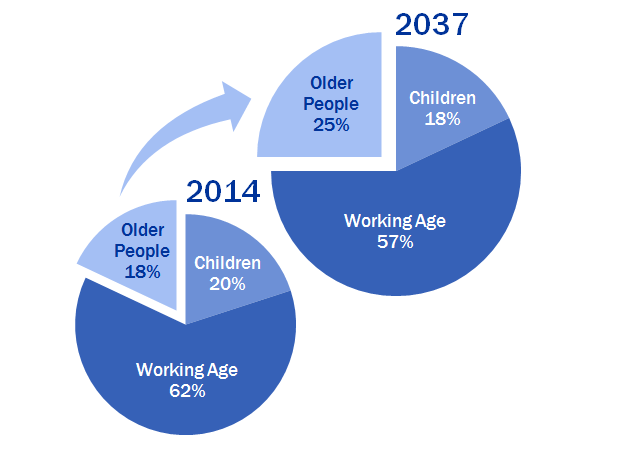 Adult Social Care predicts that an additional 600 units of Extra Care housing will be needed by 2025 to meet the demographic demands in the 65+ population and to achieve a proportional shift away from residential care placements. These additional units are needed in a range of locations across the county to meet the identified demand. Although the need for additional extra care housing is identified, SCC is seeking to decommission all existing contracts in extra care and sheltered housing during 2017. Some services may be funded through personal budgets if an individual qualifies under the Care Act. This will present significant challenge for providers and may affect the viability of some services. In addition, there may be further uncertainty about the funding of services post 2019 in view of the governments funding review. Local authorities and CCGs have a shared responsibility for providing accommodation based services to people with mental health needs. The aim is to help them recover and enable them to progress towards independence. The 2016 Surrey Homeless Health Needs Audit highlighted the prevalence of mental health problems within the single homeless population and clearly indicated a need for settled homes and support services for this client group. Surrey County Council’s 2017 review of accommodation with care and support for vulnerable adults will consider further the extent of accommodation and services needed for this client group and will establish the level of any remaining unmet needs. It is estimated that there are over 900 people with learning disabilities or autism living in residential homes in Surrey and there are a further 600 former Surrey residents living in residential homes outside of Surrey. There are also 587 individuals who are living in supported living or shared lives schemes. A review undertaken by SCC in 2014 (22) concluded that more people with learning disabilities needed to live in independent/individualised homes in their local area. More recently the HRS service has been re-commissioned under a new rolling contract model, the ‘core and flex’ model has been reviewed and is now going to be introduced more widely. A number of plans are also in place to increase awareness and understanding of services. Within Surrey there are currently four women’s refuge services for victims and their families. These units are delivered by three different providers. The refuges run at 100% occupation and places are in short supply. It is estimated, from data provided by the Women’s Aid Annual Survey of 140 refuges that on just one day in 2014, 112 women and their 84 children were turned away because they could not be accommodated in a refuge (23). The need therefore remains to increase the number of refuge bed spaces as well as the amount of support available for victims. Within Surrey there are 19 public Gypsy Roma and Traveller sites. Also, many private sites have been developed by current individuals on private land with the appropriate planning permission. There are also a number of unauthorised developments on private land, without permission, that are subject to the relevant planning laws. SCC maintains a waiting list for pitches on their sites and reported in February 2017 that they had 84 separate applications for their 14 sites. They also reported a problem with overcrowding on existing plots and long delays in moving families due to demand outstripping supply. There is insufficient housing within the County for people with substance misuse issues. Many also find it difficult to access the accommodation that is available due to their past housing history/behaviour or because their needs are considered to be too high. Temporary housing, and bed and breakfast accommodation, provided out of the County can be highly disruptive to an individual’s treatment programme leading to missed appointments or difficult journeys to attend appointments or groups and difficulties arranging the dispensing of pharmaceutical medication. There is therefore a need to develop a range of housing options for individuals in recovery including emergency beds, of which there are few in Surrey. SCC’s 2017 review of accommodation with care and support for vulnerable adults will consider the needs of those with a substance misuse problem as part of that strategy. The commissioning of HRS contracts for substance misuse have transferred to SCC Public Health and will be reviewed during 2017 and potentially recommissioned from April 2018. Providing settled accommodation for ex-offenders can prevent re offending thus reducing crime. There is currently one ex-offender service providing places within the County and there is also a county-wide generic floating support service which is able to support this client group. However the level of accommodation available is very small for the population of Surrey and any increase in the provision for single homeless people will also help this group. Each of the Surrey districts and boroughs provide a free housing advice service for those threatened with homelessness. This is a crucial high volume area of work that impacts on levels of homelessness. Government statistics (24) show that in 2015/16 a total of 2,402 households in Surrey avoided homelessness as a result of receiving advice from housing advice teams. Rent deposit’, or ‘rent in advance’ schemes are provided in many areas to those in priority need and some non-priority cases. Valuable advice services, such as Citizens Advice, and local voluntary agencies, are available and often help to prevent homelessness. This includes proactive money advice services which promote financial inclusion, improve budgeting, reduce housing and other debts, prevent eviction, provide employment advice and support benefit claims. Three domestic violence support services are available, geographically spread across the County. These services are very effective at assisting people to both obtain and maintain their tenancies. Family mediation services are provided in many areas. Single homeless and rough sleeping outreach services are now established in Guildford (HOST), Woking & Waverley (YRP outreach), Reigate and Banstead, Mole Valley, Epsom and Ewell and Tandridge (Esos). Severe Weather Emergency Protocols (SWEP) ensure that emergency accommodation is available for rough sleepers during the winter when temperatures fall below zero. Additional winter shelters or bed spaces also normally operate in a number of areas, although the arrangements are not yet sufficient to offer a sustainable solution across the County. Public Health Agreements are in place with some GPs and help to improve screening and outreach referrals for homeless people. Local authorities in England have legal powers to take action against owners who have properties that are in very poor condition. Each borough and district in Surrey works closely with owners and landlords to ensure properties are fit for occupation. Their work includes holding forums to advise landlords of changes in the law and to promote the availability of loans and grants etc. Owners of most houses in multiple occupation are required to obtain a licence from their local authority, and many also operate accreditation schemes to encourage the best management of property. If landlords do not heed the advice given and housing conditions remain poor then local authorities can prosecute and fine the owner, or work can be done in default and the costs reclaimed. The Housing and Planning Act 2016 now provides additional measures that authorities can use to deal with rouge landlords e.g. to apply for a banning order to prevent a landlord operating in the area. Cold homes can give rise to health issues and there are many initiatives being implemented in Surrey to prevent fuel poverty. Each of the Surrey district and boroughs provides funding to adapt existing homes to make them suitable for occupation for people with disabilities. These works are often facilitated by Home Improvement Agencies who provide stair lifts, level access showers, extensions to homes and handyperson schemes. Technological solutions such as Careline, Telecare, falls/bed detectors, smoke alarms etc are also being provided by agencies in Surrey. These are valuable measures that help people to remain independent, reduce the risk of trips and falls, and facilitate the early return of patients from hospital. Currently the programme of HRS services in Surrey is delivered through a range of contracts and grants split between four separate commissioning arms. As indicated elsewhere in this chapter, all these service contracts are subject to review during 2017 and the range of provision in place from 2018 may be different to that currently provided. The government funding review may also affect the future make-up of the supported housing sector. There are many benefits that come from the provision of HRS services including homeless prevention and reduced use of health and higher cost specialist services. The challenge for those undertaking the review is to ensure these benefits are not compromised. This JSNA has identified that accommodation and services are required for a wide range of homeless people. The 2016 Surrey Homelessness Health Needs Audit Report (2) has also assisted in providing valuable data on service needs and gaps. The Health and Wellbeing Board has recently considered the results of the 2016 Audit and has acknowledged that homelessness generates significant expenditure for a whole range of public services, including health, social care and criminal justice agencies. They are also aware of the significant challenges when dealing with homeless people with complex needs. A strategic approach to commissioning housing related support for the homeless and socially excluded groups is now essential, particularly in the light of the Homelessness Reduction Bill. Agencies need to review their current plans and strategies and consider if there are any measures that they can take that will help to reduce homelessness within Surrey. Homeless people need accessible alternatives to hospital services and Public Health Agreements need to be established with many more GPs to improve screening and outreach referrals for homeless people. There is also a need to raise awareness amongst professionals of the current services available for the homeless. Older people – Organisations in the public and private sectors need to work together to provide additional extra care units for frail older people in most districts and boroughs. Extra Care is being explored by the borough and district councils in conjunction with Adult Social Care as part of a wider review of housing options for older people. Young people – An assessment of the needs of young people is currently underway and will provided detailed information on needs and gaps, however in the meantime it is known that accommodation and services are required for unaccompanied asylum seeking children, including those who are over 18. Victims of Domestic Violence – There is a need to increase the supply of refuge beds, and support services, for victims of domestic abuse. People with learning disabilities – The provision of ‘core and flex’ services for people with learning disabilities has been very successful, however there is a need to extend these services to more users. People with substance misuse issues – Managers within the drug and alcohol teams have said that a range of housing options are required for people who have had drug and alcohol problems but are now in recovery. They feel that in some cases treatment and recovery would be more effective if individuals could be transferred or rehoused in an alternative location e.g. another borough. There is also an on-going need for floating support for those with complex needs who require help to initiate, or sustain, a tenancy. Gyspy and traveller households – There is a need to increase pitch provision for gypsy and travellers to reduce overcrowding within existing sites. A strategic approach and mechanism for reviewing the level of need, planning, commissioning and monitoring HRS contracts in the County needs to be established for the future. There is a need for a better range of pathway plans for different client groups to help prevent homelessness and meet housing need and to identify and address potential ‘barriers’ and constraints within the system. As indicated elsewhere in this chapter there are many households seeking affordable housing in Surrey. All types and bedroom sizes of accommodation are needed. Smaller units are required for those who need to downsize and family homes are needed for larger households. It is therefore clear that all agencies in Surrey need to work together to increase affordable housing supply across the County. There is a need to raise awareness amongst health and social care professionals of the range of services available to tackle poor housing conditions and the benefits of doing this. Thanet Council had a multi-agency referral scheme between housing, health and social care workers, which ensures that when households are visited by health staff, information is collected about poor housing conditions and this is then shared with other services. Similar initiatives should be considered in Surrey. ensure that the Health and Wellbeing Board includes measures to reduce homelessness in their key strategies. ensure that housing issues, including the need to prevent homelessness, are addressed within the various County Council reviews of HRS services and within the Accommodation with Care and Support Strategy. ensure that the findings from the recent Homeless Health Needs Audit (30) are addressed within health and social care commissioning. Identify all available opportunities to increase affordable housing supply e.g. by using public land and assets to provide new schemes. Influence the type of housing supply (both public and private) to ensure it meets identified needs and current gaps in provision. Identify and implement new initiatives that will reduce homelessness and the use of emergency and temporary accommodation and implement the requirements of the Homelessness Reduction Bill. Review and develop pathway plans for different client groups to help prevent homelessness and meet housing need and to identify and address potential ‘barriers’ and constraints within the system. Ensure that multi-agency mechanisms are in place to jointly review HRS contracts and that cross county commissioning continues for all relevant HRS contracts (e.g. for specialist tenancy support and Domestic Abuse services). Progress the opportunities for developing the Public Health Agreements for Care of the Homeless and continue to encourage GPs to sign up in targeted areas where there is higher levels of homelessness. Ensure effective access to primary health care and public health interventions in day centres or drop in services used by single homeless and socially excluded groups. improving data collection and analysis of homeless and housing need across the county. repeating the Health Needs Audit in 2018. 12) Smoking, the environment and meningococcal disease, a case control study, Epidemiological Infection,112 (2), 315-328 ,Stanwell-Smith RE, Stuart JM, Hughes AO, Robinson P, Griffin MB & Cartwright K, 1994. 19) Data is an estimate based upon 2011 Census figures using S Walby Violence Against Women and Girls Ready Reckoner. London: Home Office. 20) Extract from JSNA chapter Reference Application Form: Funding to strengthen accommodation based specialist domestic abuse service provision – Simon Rosser – Reigate and Banstead 2014.